This post represents a first for meâ€¦it is the first time I posted the same day I cooked something. Usually I am pretty lazy and there is a week or even a month between cooking and posting. I am going to try and get better about that, or just stop worrying about writing witty things at the beginning of each post and instead throwing up some photos and a recipe. The inspiration for tonightâ€™s dinner came from some posts I saw on baked eggs (here, here and here), coupled with a severe case of the lazys. Baked eggs can be made lickity split and, more importantly, donâ€™t require much thinking. For my version, I went with bacon, cheddar and tomato as the flavorings. You could probably come up with tons of other ones. Each of the recipes I linked to has a completely different take. Baking an egg is pretty simple. There are two things to remember: 1) placing the ramekins in a hot water bath while they cook in the oven helps the eggs cook evenly and 2) the egg white will never set firmly, instead judge doneness by waiting for the egg whites to turn white or opaque. Placing the ramekins in a boiling water bath can be a painâ€“and this is supposed to be an easy dishâ€“so donâ€™t worry about it if you donâ€™t want to. For more photos and a toaster-oven version, click here. How long do you keep this in the ovan? Pingback: What I’ll be having for breakfast Saturday morning! | Are You Not Impressed? Quick question: Is the egg yolk a runny consistency after it is baked? Since I am not a fan of a runny yolk, I usually eat my eggs scrambled or hard boiled. Just wondering if this recipe is for me. Thanks in advance for the help! 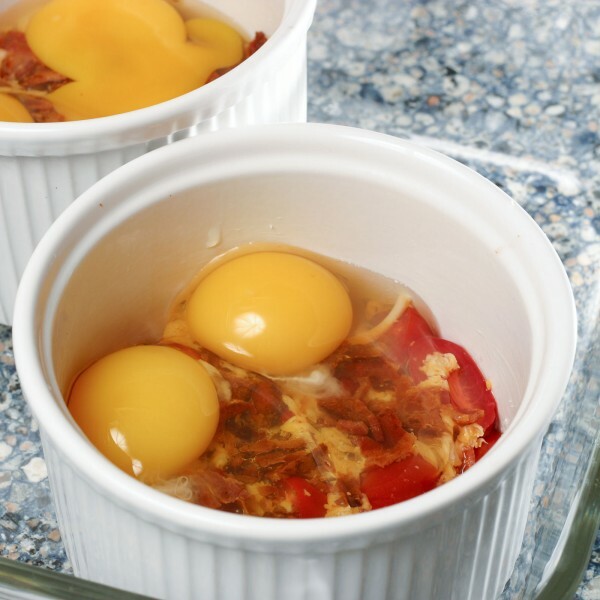 It is sometimes hard to predict if the yolks will be hard, but if you cook it for about 20 minutes it should be good. You can always take a peek and put it back in for a little longer if it hasn’t set yet. i love eggs. this will be my next power breakfast. I just made this today for the first time, and I have never had such a delicious egg! I added 1 tbsp. cream, cheddar cheese, salt & pepper. It was so good I can’t believe I’ve never tried it before. I can’t wait to try everyone’s version. Thanks for sharing! I made some this weekend where I sauteed in a little butter some potato, portabella mushrooms, onion, garlic and spinach with a little salt & pepper. I put that filling in the ramekin, put a little shredded cheddar & cracked the egg on top. I baked for about 12 minutes at 350, put a little more cheddar & then baked for about 5 minutes more. Yummy !!! That sounds like a great combo! It is sort of tough to go wrong with those ingredients. Fact is the dish can substitute anything for anything. throw all sorts of veggies or meat at the bottom of that thing for a down home or a classic taste. This is now apart of my cooking repertoire. I USED PROSCUITTO, ROSEMARY, AND HAVARTI SLICED CHEESE. MIX IN SOME COSTCO PREMADE BRUSCHETTA AND IT WAS TO DIE FOR! THANKS. ooh! i make this with a chunk of cream cheese, smoked salmon, and a sprinkle of dill under the eggs! I like to use the leftovers from the previous night’s mexican food in this recipe. A little spicy ground beef, some shredded cheese, a dollop of pico de gallo and sprinkle with green onions, all leftover! YUM! I can’t wait to make this. It looks so yummy and it was nice to read peoples’ variations on the recipe! I also have made baked egss both in a water bath and not in a water bath. Not too much difference with eggs, but I would never skip it on my creme brulee. I make a version with a thin slice of prosciutto on the bottom, cubes of avocado, parmesan cheese, crushed red pepper and of course eggs. 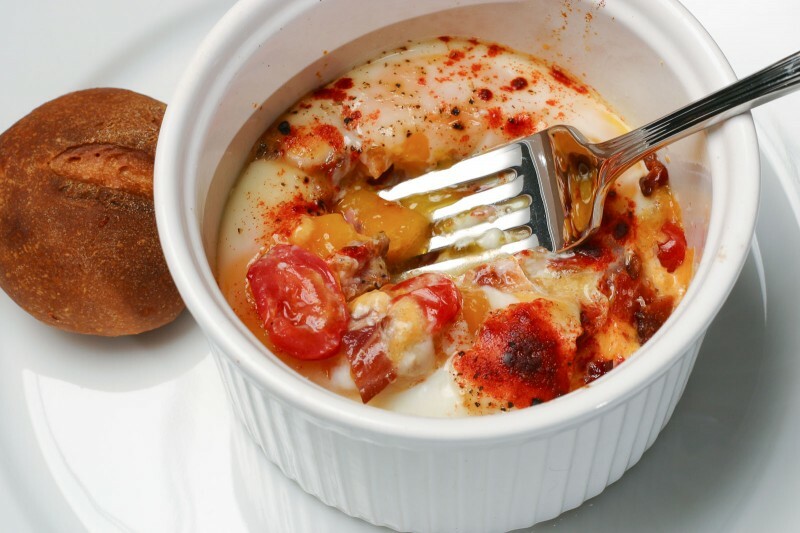 Very delicious– fun to think of all the ways to jazz up your baked eggs. Thanks for your website. Thanks Michelle, I will go take a look at your version. The water bath was a bit of a pain so it is good to know that it isn’t needed. i read all the same pieces you did, and this is now my favorite way to eat eggs. i made/blogged a version with sausage and spinach that was AWEsome. i ignore the water bath, and they come out just fine.